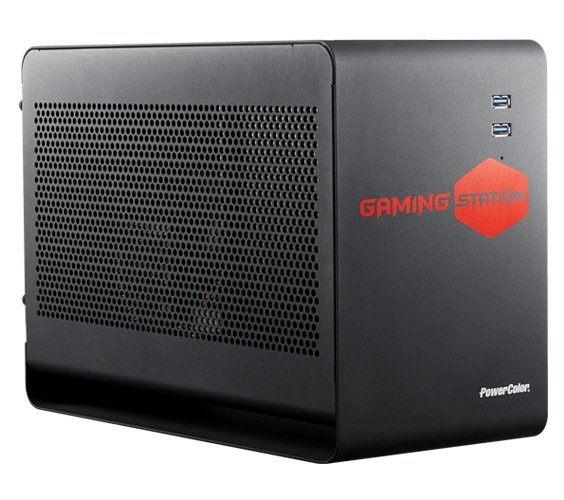 PowerColor recently announced its second eGFX enclosure named, Gaming Station. 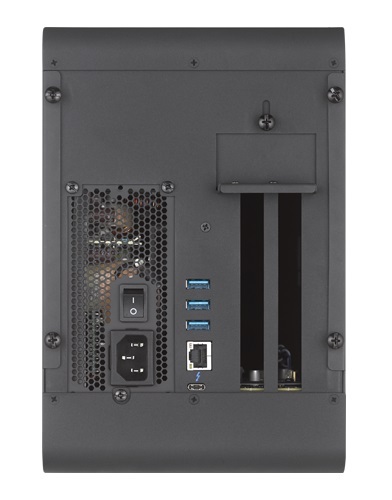 The Gaming Station, like the Devil Box preceding it, is an accessory which enables gamers to connect desktop level video cards to laptops, AIOs, or SFF PCs using the Thunderbolt 3 interface. The Gaming Box is slightly smaller and moved away from the angular look of the Devil Box to a more traditional black, rectangular, almost UPS-like, appearance. It supports select NVIDIA and AMD GPUs through AMD's XConnect technology and comes with a 550W power supply able to easily power the compatible video cards. The Gaming Box joins an increasing number of TB3-based external enclosures with the ability to run desktop level video cards. 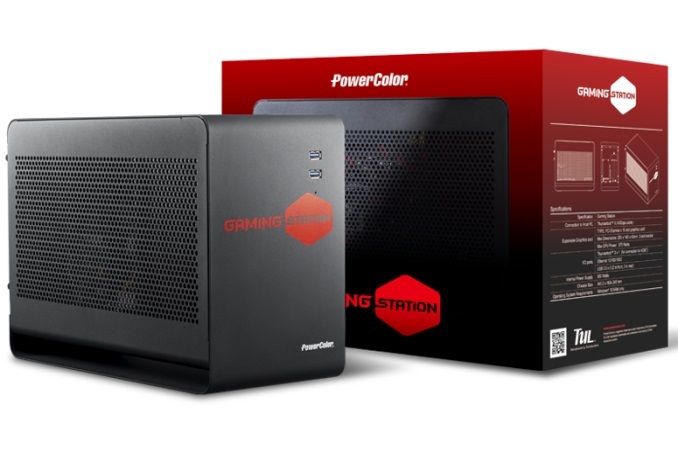 On the outside, the PowerColor Gaming Box is matte black with the Gaming Station and PowerColor name, as well as two USB 3.0 ports, on the front panel. All sides of the enclosure are closed off except for the left side which has small circle vents taking up most of that side to allow fresh air to enter and cool the video card inside. Surprisingly, we do not see any (RGB) LEDs on the enclosure. The dimensions are smaller coming in at 343.2 x 163 x 245mm (13.5” x 6.4” x 9.6”) versus 400 x 172 x 242mm on the Devil Box so portability has increased, if only by a small amount, via size. The device uses a single Thunderbolt 3 port on the back panel able to offer 40 Gbps bandwidth. Internally, this translates to the installed graphics card able to access PCIe 3.0 x4 lanes. Both the TB and I/O cards are the same ones found in the Devil Box according to PowerColor. As time goes on and other options hit the market, we are seeing now dual TB3 connectivity for increased bandwidth and flexibility.PowerColor did not mention when or if this will be included in future iterations. In addition to the Thunderbolt 3 port, there are three more USB 3.0 ports as well as a Gigabit Ethernet port to enable high-speed wired internet on ultra-thin laptops or other devices that do not feature GbE. Internally, the Gaming Box supports GPUs up to 310 x 157 x 46mm (12.2” x 6.2” x 1.8”), enough to support a double-wide video card, through a full-length PCIe slot running in PCIe 3.0 x4 mode. The Power Supply is also different now using an SFX format and rated at 550W 80 Plus Gold; an upgrade from the Devil Box at 500W. Unlike the Devil Box, the Gaming Box does away with 2.5” HDD/SSD support. If storage expansion is a goal through an eGFX enclosure, users will need to select the Devil Box instead. For GPU compatibility, the Gaming Box lists AMD Radeon R9 285/290/290x/300 series, R9 Nano/Fury, and the RX400 and RX 500 series. On the NVIDIA side support ranges from the Kepler based 750/750Ti the 900 series, 1060/1070/1080/1080Ti, the Titan X/Xp, as well as select Quadro chipsets. The Gaming Station will be available 12/15 with an MSRP of $329. This is priced less than the Devil Box's MSRP upon release ($399). "a full-length PCIe slot running in PCIe 3.0 x4 mode"
Is my math right, is this a 830cu (13.6l) enclosure? I can fit a whole PC in there so what's the incentive to buy one of these? It's not portability because a laptop + this is about as portable as a PC + a monitor. > I can fit a whole PC in there so what's the incentive to buy one of these? That was the whole question. Since clearly you can't carry it around portability is out the window. So you're buying a big "something extra" which accepts "select cards" and that you have to combine with something else to get a half decent compromise? And at that price you're not saving much if anything. Yes, we already have 7.6L ITX case that houses a full 1080ti and 7700K CPU.